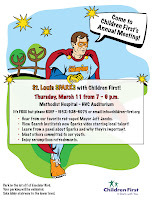 Plan to attend the Children First annual meeting on Thursday, March 11, 7-9 p.m. at Methodist Hospital in the lower level auditorium. Refreshments will be served, courtesy of CRAVE Restaurant. The focus will be on Sparks, something inside a young person that gives him or her excited and gives their life meaning. Sparks can be a talent or skill, something they feel deeply about, or a quality they know is special. – A skit with Mayor Jeff Jacobs and high school student Jane. – The premier of Search Institute’s Sparks video featuring St. Louis Park teens. – A panel will discuss Sparks, what they are, why they’re important and how all of us can encourage their development. The panel will be emceed by youth co-chair Kelsey and feature Becky, Citizens Independent Bank, Oscar, St. Louis Park High School multicultural liaison and high school students Austin and Bria.